Load up on play kitchen and grocery store essentials and get playtime rolling with this durable rolling grocery basket filled with play food boxes and cans! Lift the basket handle to carry, or extend to roll. 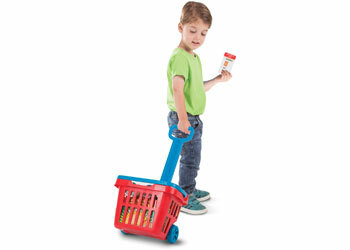 Mark the double-sided reusable shopping list with a pencil that stores in the side of the basket! 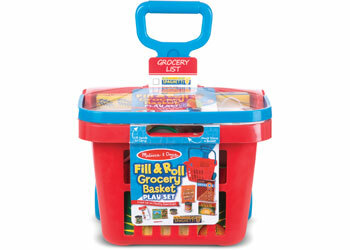 The play set includes five colourfully labelled grocery boxes and three play food cans with pop-off lids for a realistic shopping experience for kids three and older.